What is the Answer to the Question: Is there an Answer for Which There is no Question?? A few days ago, in a post titled “Questions and Answers” I proposed an exercise: I suggested writing a list of all the questions you could think of that have relevance for you, along with all the answers for them that you could provide. I suggested that this could yield clues about who and what you are. When I wrote my list, one of the questions I wrote was: “Are there answers for which there are no questions? My answer was: “Yes, and here are two of them: your consciousness, and the universe.” My question today is: Is there an Ultimate Answer, one answer for which, and about which, there is absolutely no question? Think about that for a moment. If there is an answer for which there is no question, then it is beyond question. To be beyond question, it has to be self-evident. If it is self-evident, then it is beyond argument and debate. If you find such an answer, it is The Answer, and then there is no need to question, no need for any other answer, no need to seek further. You have achieved the end of all quests, and you know your reason for being. I think the most important question for anyone who has not yet found The Answer for which there is no question is: Has anyone found The Answer? I am disagreeing with one of the most renowned thinkers of all time, a man considered by many to be the last person who was able to know everything that could be known during his lifetime, the un-rivaled polymath, Gottfried Wilhelm von Leibniz. I am disagreeing with him because he said the most important question is “Why is there something instead of nothing?” and I am saying, no, the most important question is: “Does anyone have The Answer?”. Q: Why is there something rather than nothing? A: Because by definition, nothing does not exist. To elaborate: If nothing does not exist, then something must exist, because if something does not exist, we have nothing, which by definition, does not exist. Therefore, something does exist, and I think that is something we actually knew all along. The present discussion is a continuation of the Questions and Answers post. In that post, I suggested that the questions you pose, and the way you pose and answer them, provide clues as to whether you are a thinker or a doer. This question: “Does anyone have The Answer?” carries the dichotomy a bit farther. Your answer to this question may identify you as a believer or a dis-believer. Notice that I did not say believer or skeptic. A skeptic falls in between believer and dis-believer, and I suspect that most people are not really believers or dis-believers. I think most people alive in the world today, regardless of what they say they believe, are probably skeptics. But, the question of whether anyone has the answer is of paramount importance to everyone, whether believer, skeptic or dis-believer. Until you ask and answer it for yourself, you have no way of knowing who you are. Be careful, this is a tricky question. It has two parts: First: Is there an answer for which there is no question? And second: if so, does anyone have that answer? I have suggested that there is an Ultimate Answer, and that it has something to do with the indisputable self-evident existence of consciousness, the universe and the non-existence of nothingness. But, what is The Answer? 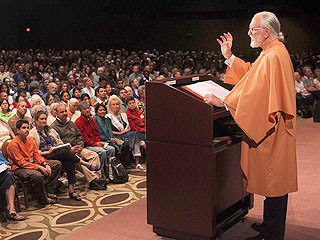 You have to be careful, because what may seem to be an easy one-word answer to the ultimate question, an answer like: God, Jesus, Buddha, Krishna, etc., is not an answer for the “thinker”, and is irrelevant for the “doer’. The doer says: “Don’t bother me with such questions, I’m busy doing.” and the thinker says: “Don’t ask me to do something right now, doing anything is just meaningless activity until I have The Answer”! The skeptic, on the other hand, goes on thinking and doing without knowing whether his/her thoughts are true or false, and/or her/his doing is purposeful or meaningless. The scientist is the ultimate skeptic. The scientist knows that what appears to be true today may be overturned by new evidence tomorrow. There is no ultimate answer in science. But extreme skepticism is very dangerous because it often leads to the belief that there are no ultimate answers, and such a belief can lead to lack of integrity, dishonesty and deceit. If there is no unquestionable answer, then no one can have found it, and we descend into chaos. But, my consciousness, your consciousness and the universe actually do exist. Not only that, they persist and appear to have persisted in some form for hundreds of thousands of years, perhaps even billions of years, in a completely ordered manner, suggesting that there is meaning and purpose, i.e., an ultimate answer.